Sedona Phoenix Shuttle. Sedona Tourism. Sedona AZ Arrival Guide. 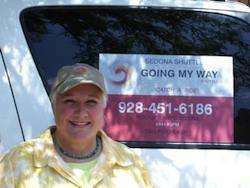 SEDONA PHOENIX SHUTTLE Arizona Shuttle Service. Flagstaff and Phoenix Shuttle to Sedona Arizona. Maps. Fare. Drive Times. Full Sedona AZ Vacation Guide. Tips and Top Picks. SHARING A VAN. $45 One Way, $85 Round Trip. RESERVATIONS ARE REQUIRED. Meet the van in the curbside Shuttle Area at the airport. The return to the airport drops passengers off at their particular check-in area. Approximate drive time is just under 3 hours, with 1 - 3 quick stops, depending on where you're picked up. PRIVATE CAR SERVICE. About $270, including one, two or three people. Personal airport arrivals greeting by a uniformed driver. Top quality Lincoln Town Car L Livery version. Note: They also White Tie also offers private tours around the area for about $65 per hour, including up to three people. And you can use this option as a way to be transported from and back to Flagstaff. Basically, this service is just A GAL WITH A VAN. A good, reliable one? I haven't taken it myself, but I've heard Sanna, the driver is a nice lady and this upstart company is going strong (and we love supporting good upstarts). There isn't much in the way of Flagstaff airport shuttles. NOTE: Silver Spurs used to offer service, but cancelled it. By the way, if you know something we don't, and would like to email us a comment or suggestion, click here. You're input is always helpful for keeping all the info on this site current and reliable. << Return to the Main Getting to Sedona Map & Guide page. >> Go to to the Sedona-Happy HOME page from this Sedona Phoenix Shuttle & Flagstaff Airport Shuttle page.